New Zealand netball team Rolleston INSPIRE locked horns with Samoa’s Oriana Development Academy at the National University of Samoa gym on Saturday. But the friendly game between the two sides was all in the name of developing further the sport of netball. Christchurch-based Rolleston Golden Oldies manager, Leanne Jessep, said the trip to Samoa was for her team to gain experience and visit schools in Samoa. “It is significant that the team we brought over has the chance to adapt to a different style of play and they got the chance to play on grass which they have never done before and did that in at Faleata College,” she said. The team has visited Fagamalo Primary School, Peace Chapel Primary School, Samoa College and Saint Mary’s College and also played against Faleata College, Don Bosco College in Savai’i and Church College Pesega. The game against Oriana Development Academy closed their program. Leanne said they travel to Samoa every two years and the trip focuses on netball and building relationships with school principals and Netball Samoa. A Rolleston INSPIRE netball player, Dakota Bishop, said that it was her first time in Samoa and it is a beautiful country. “I got the chance to play on the grass for the first time and it was different it was like playing touch rugby but without the touch boots, a bit slippery but loved every moment of trying different courts,” she added. A representative from the Oriana Development Academy, Christabelle Onesemo Tuilaepa, said she loves netball as it helps keep her fit and healthy and she wants to become as a professional netball player in the future. 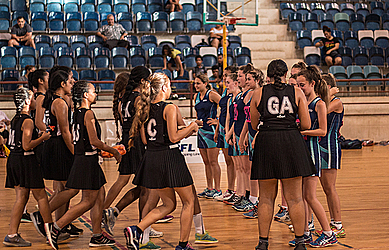 CEO of Netball Samoa, Rosemarie Esera, said that it was a great opportunity for players from Oriana to put what they have been learning into practice and it is part of their development programme. “It is the aim to encourage our girls to play netball so that we have a stronger participation in our national team. But the development of netball in Samoa is thriving and we have a lot of programs for all levels,” Rosemarie added. Rolleston INSPIRE stands for Netball South Pacific Island Rolleston Experience.